New Yorkers protest pro-Israel parade | Fight Back! 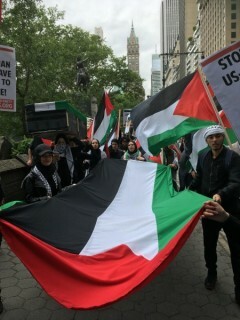 New York, NY - Over 70 Palestinians and solidarity activists protested the Celebrate Israel Parade on June 3 in New York. The parade commemorated the 70th anniversary of Al Nakba or “the catastrophe,” when the ethnic cleansing of Palestinians led to the founding of Israel. After the rally, the protesters marched to Columbus Circle with the coffins held high and a large Palestinian flag waving in the wind, handing out flyers to educate people about Palestine. The action was organized by the NY4Palestine coalition. To stay updated on their upcoming actions and events, follow them here https://facebook.com/NY4Palestine/.